William Ashenden is an agent with the British Secret Intelligence Service. By trade he is an author, a man who has written a novel or two, if inferences can be believed, but who is better known for the plays that he has devised. Most often these plays are of a humorous nature for in the years leading up to the Great War and into it things which can take a person's mind from the seriousness of the world's situation are much to be desired. More importantly, since his plays do not deal with world events or politics or anything so somber and controversial, their nature do not bring him particularly to the attention of the nations in which he might travel. This is by no means an accident. Ashenden had been a writer living abroad for several years, being likely in his late 30s at the time of the first recorded adventure. As nation after nation fell into one of two major camps and the bombs started flying, he eventually made his way back to his native England where his intention had been to reside until the bloodshed ceased. A chance meeting with a high ranking member of the SIS would change that. The man, known officially as "R", presented to Ashenden the idea of moving to neutral Switzerland and working as a covert operative for Britain. He would be given a few different identities to use to travel to neighboring countries and would issue regular reports on things he learned, both militarily and politically. Being a very patriotic man and not a little interested in the exciting task, Ashenden agreed almost instantly. It would not be correct to think of Ashenden as a man of action in the stories related about him but not because he could or would not be but because the situations he was in were usually of the type where subtlety is called for far more than action but when the need arises, he is a fast mover and quite decisive. The most important thing that Ashenden is, obviously one which makes him a good writer, is his ability to observe and record. He has a great skill in just watching and listening. The latter causes people he meets to feel the urge to talk and in the many ramblings, he gleans the information that he came for. 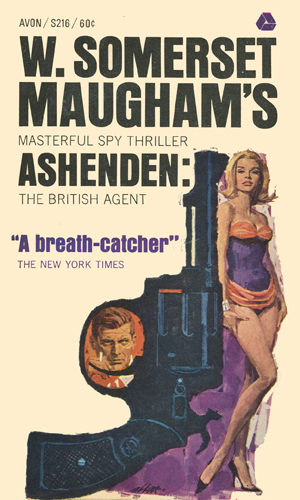 The author, Maugham, was Ashenden and it was his own adventures that provided the basis for his fictitious alter-ego. He says in his foreword that he has fictionalized them because while life itself may seem random and haphazard, good entertaining fiction must not be. The two books mentioned below are the ones that involve Ashenden. The first is the collection of short stories, described fuller in the next section. The second is a novel dealing with a woman whose sexual nature were to cause her no end of trouble. Ashenden does not play a direct role in the tale but he is, for whatever reason the author had, the narrator of the tale. It is definitely not a spy novel. Contains the short story adventures of Ashenden during the War to End All Wars. Edward's first wife was the secret behind his success but when he later remarries and sometime thereafter passes away, his second wife is the first to villify the lady. 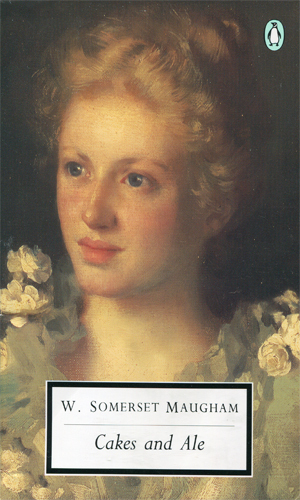 Only the narrator, Ashenden, understands how much of a muse Rosie had been to several different men. During the First World War, author W. Somerset Maugham had worked, especially in the latter years of the conflict, as an agent with British Intelligence. He used those experiences to craft his tales. How many are of things to happened to him or to others or were just imaginings of a very creative writer are not known. One source indicated that Winston Churchill had suggested that some of his stories be destroyed and never published. It is not known if any of these were in that list. It should be noted that some listings do not include the first one that I have included, titled R, treating it as just a introduction. I include it only to let it be known it exists and because it does set up how and why the other stories happen. The 17th on the list was not reprinted in the book Ashenden but was a part of his Collected Short Stories, volume 3, which was released in 1951. This story tells briefly how Ashenden was recruited by the head of British Intelligence, a man known only by the initial R, and how Ashenden is sent to live and spy back on the Continent. Returning from a weekly trip to France to deliver his regular report, Ashenden is surprised to find two Swiss Intelligence agents waiting for him with quesitons. Now Ashenden has to worry about who else in his hotel is spying on him. The aged governess of two adult daughters of an Egyptian Prince, a woman of British nationality, wants nothing to do with Ashenden as the group she is with stays at the same hotel as he in Geneve. At least not until she is on death's door. Meanwhile, the Prince is far too interested for Ashenden's like. Ashenden is being sent to Italy along with a Mexican general named Manuel Carmona, a man devoid of any hair on his head. That man is to intercept a Greek passing info to the Germans. This story revolves around how the two are introduced by R and begin their journey from France. On the train trip to Italy, General Carmona imparts to Ashenden the story of the beautiful woman who the General once wooed, only to decide after the conquest that she was likely a spy. Though he has always felt he could never get bored, Ashenden learns how slow the clock can move while waiting for General Carmona to arrive with info about the Greek. What is learned stuns both men. Brought to Paris to meet with R to discuss the next major assignment, Ashenden finds a chance to learn a great deal more about his boss. Chandra was a major player in Indian politics, a man who wanted so much for the British to leave his land that he allied himself with the Germans to incite trouble at home. Ashenden's job was to entice him to leave the neurtal Switzerland for France to be arrested or killed. Gustav was one of the best informants that the SIS had in Switzerland, a man who traveled widely in Germany and had a good deal to report. Ashenden's job was to find out if any of it was true. The English ex-patriate with the German wife was almost certainly a spy for the Germans, turning on his own nation for money rather than fealty. Ashenden was to assist in bringing him home to face his judgment. While in Russia on a mission, Ashenden learned about a secret about the American ambassador to there that helps the British ambassador. During a dinner with the British Ambassador to Russia while on assignment there, Ashenden is told a very personal story supposedly of the Ambassador's friend's early adulthood but likely that of the teller himself. Ashenden is not pleased to hear it. To try and keep the Russians in the War, Ashenden is sent to Petrograd. He must travel from Vladivostok via the TransSiberian rail, ten days on a train. His traveling companion is an American named Harrington who does not know how to not talk. In Petrograd and needing a translator to help him convince Russian officials to stay with the War, he considers using a woman he had been much in love with and he recalls how they met and how they handled the fact that she was already married. As Ashenden tries to convince the current government in Russia to remain in the War, Mr. Harrington is working diligently to get his business deals signed. All goes awry when the Bolsheviks wrest power. Anxious to now get out of Russia, Mr. Harrington is determined to not leave without his laundry, a very grave mistake. First published in International Magazine in December, 1938. For health reason, Ashenden is sent to a sanatorium. This story depicts his time there and the people he meets. 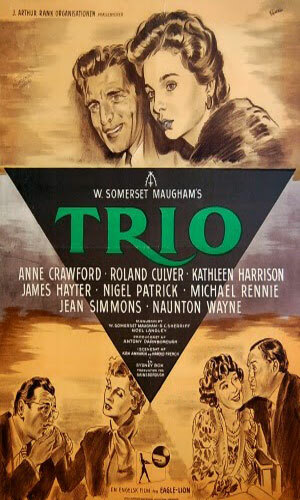 The one movie made from the stories about Ashenden was directed by the renowned Alfred Hitchcock and starred the terrific John Gielgud as the title character. In this production, which is said to be a 'loose adaptation' of two stories, The Traitor and The Hairless Mexican. In this movie, the first name of Ashenden is given as Richard. As WWI wages three British agents are sent to assassinate a mysterious German spy. Two begin to have serious questions of conscience as the time of the killing closes. Three short stories made into short films, each introduced by the author. The Verger deals with a verger at a church forced out by a new vicar and how the man deals with the change. Mr. Know-All has a friendly traveler on a cruise who manages to rub everyone the wrong way. Sanatorium is about Ashenden and others staying at the convalescent home for various reasons and how they deal with their conditions. BBC TV-movie. Ashenden must find out if the Englishman with the German wife was a turncoat, spying on behalf of Germany. If he was, Ashenden was to stop both of them. Bringing the character of Ashenden to life in a 4-part television miniseries, the producers present an interesting take on the life of the characters and those around him during the First World War. While Ashenden's first name is never mentioned in the short stories, though it is given as William in his narration of a subsequent book by Maugham, he is called John in the miniseries. Further, the conflict between Ashenden and his two bosses, Cummings ("C") and "R", is played up a lot whereas in the stories it does not, IMHO, exist. Nevertheless, the atmospherics from the miniseries is quite good and the acting superb. 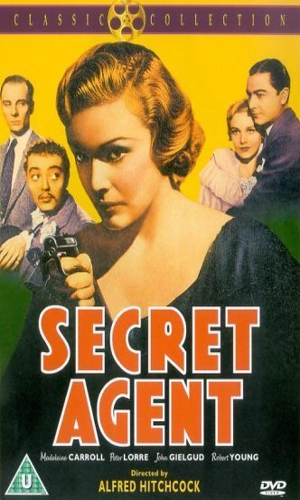 I had at one time a hard-set rule about only dealing with spies from the post-WWII era. I broke it with Ashenden for two reasons. The first is that several people asked why I did not mention him at all considering that, second, he was the first real spy series written. There had been spy stories before, such as James Fenimore Cooper's The Spy from 1821, but for a repeat protagonist, I had never discovered an earlier one. Obviously I changed my mind and I am glad I did. I had read the first couple of stories a few decades ago when I first got into spy adventures and was far too quick to judge them poorly. The writing was good, I was wise enough to realize, but there was so little action. I put the book down to be picked up later, which never happened. This time I am much older and, hopefully, wiser. I started from the beginning and have found that the writing is more than good, it is superb. No wonder this man is considered a genius and was the most successful writer of his generation. The prose is some of the best I have every read and each passage has a place and a purpose. There is still not a lot of action but the sense of foreboding and fearful anticipation that comes across Ashenden's mind is palpable. He is not a coward by any means but standing in the shadows or sitting alone in a room waiting and waiting, all sorts of imaginings are impossible to prevent. Do not attempt these stories if you are expecting car chases, gun battles, fantastic derring-do, or such because they are not in these pages. If you enjoy a well-produced short story with incredible word play and atmospherics, they are well worth the time to savor them. It is not uncommon in the real world of today as well as the fictional world of espionage for people in authority to be distrustful of writers and reporters, believing them to really be spies undercover. Considering the nature of stories such as those of Ashenden, especially knowing they were loosely based on real life, that suspicion is obviously sometimes justified.